We sat at the bar, all the better to watch the much-talked about T. Fable Jeon at work. 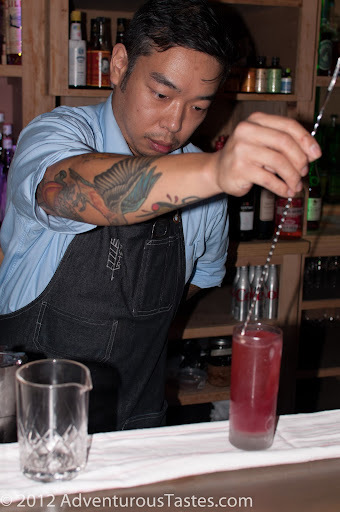 Cocktail geeks know Jeon as the former cocktail guru at Sound Table and The Lawrence and one of the Beverage Network’s 2011 Ten Mixologists to Watch. Not surprisingly, The Pinewood has an impressive cocktail list, replete with lesser seen classics like Sazeracs, Tom Collins and Hemingway Daiquiris. 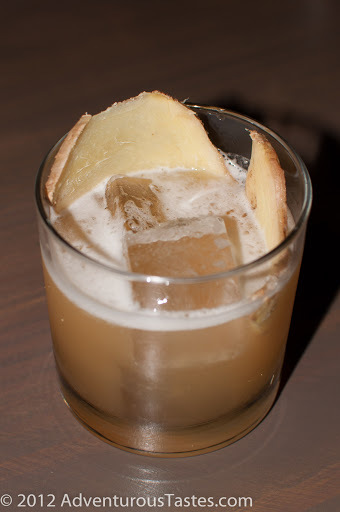 The Mr. enjoyed a Day That I Die ($11 and made with Bulleit Rye Whiskey, Fresh Lemon, Ginger Syrup, Buckwheat Honey Syrup and Roasted Georgia Pecan Tincture). As you can see in the pic, it wasn't shy with the ginger, but the honey syrup provide balance to keep it from being overwhelming. He loved it! I am off liquor at the moment, and I was feeling very dismayed not to be able to enjoy one of Jeon's creations. 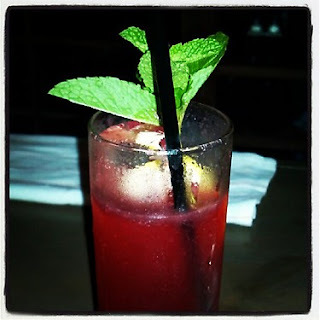 Well, lucky me, the oh-so-friendly Jeon offered to whip me up a mocktail, made to my specifications. I suggested refreshing and fruity but not too sweet, akin to a Pimm's Cup. 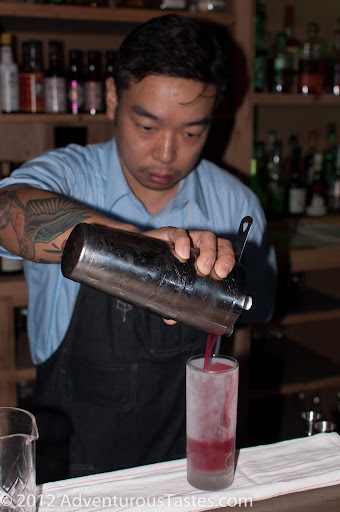 With all the finesse you expect of a "mixologist" (vs. a bartender), Jeon combined ginger beer, muddled berries, and grapefruit juice to make an oh so delicious beverage. And I didn't miss the booze in the least! 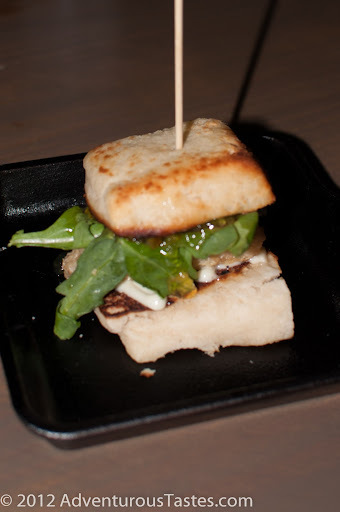 As we sipped our drinks, we nibbled on the crispy pork belly biscuit with marmalade, arugula, and Duke’s mayo ($7). Simple sounding, right? But oh good lord, is it good. I was supposed to share, but I seriously considered scarfing it down before my honey could come near it. It is a testament to my love for him that I shared it at all. Salty, sweet and fatty...drool! 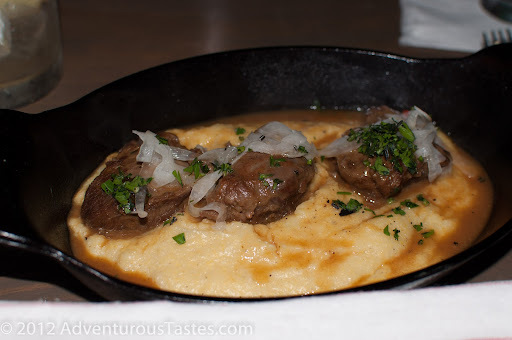 For entrees, the Mr. chose the Braised Duroc Pork Cheeks ($22) served with emmentaler polenta, shaved fennel and traditional gremolata. The dish was nicely seasoned and tender, and perfect for these newly chilly nights. It was a wee bit pricey for a filling but not huge dish, but was enjoyed nevertheless. served with fingerling potato hash with wild mushrooms and Pine Street bacon. 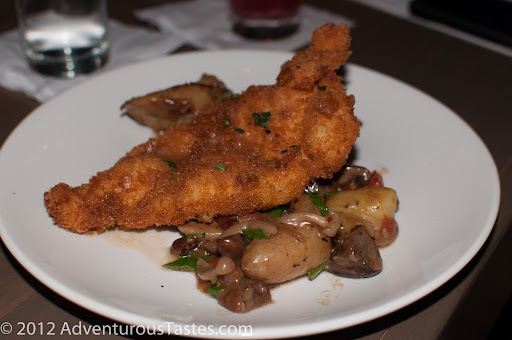 I was picturing more traditional fried chicken, but this is in fact something closer to a schnitzel coating. The chicken was juicy and the coating was nice and crispy, albeit it a little less salted than I prefer. Don't miss out on their weekly specials either...Sunday brings 1/2 price wine, Mondays $5 New Orleans cocktails, Tuesdays buy one get one free entrees, Wednesdays 1/2 price whiskey cocktails,and Thursdays buy one get one free apps.